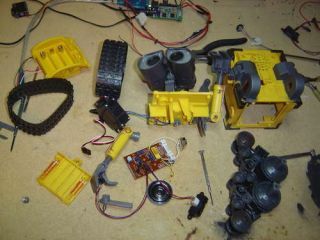 Build your own moving Wall-E robot! Fed up with a Wall-E robot that did nothing, a hacker decided to get inside the little guy's chassis and soup him up a bit. Using a few LEDs and infrared sensors, servos to move the arms, head and tracks and a microcontroller, Wall-E was brought to (autonomous) life. A few thousand lines of code later and he was ready to explore his own world, where he could move his body and guide himself around an area using a 2D map. Albeit fairly slowly; we suspect the real Wall-E could take him in a race. However, check out the YouTube video of the build if only for the brilliant moment when he appears to flip off a model of Doctor Who's dog, K-9.